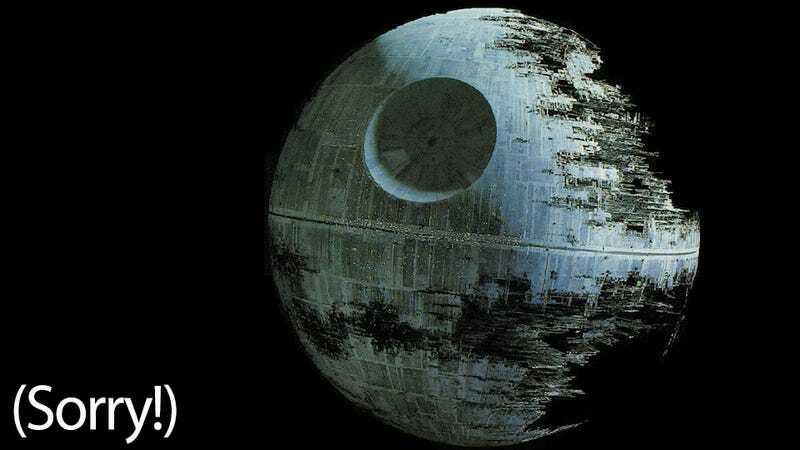 The White House has turned down a popular petition to begin construction on a Death Star in fairly hilarious fashion. "The Administration shares your desire for job creation and a strong national defense, but a Death Star isn't on the horizon," writes Paul Shawcross, chief of the Science and Space Branch at the White House Office of Management and Budget, in a response titled "This Isn't the Petition Response You're Looking For." Among the reasons listed are the estimated $850,000,000,000,000,000 cost ("We're working hard to reduce the deficit, not expand it"), and the known Death Star vulnerability ("Why would we spend countless taxpayer dollars on a Death Star with a fundamental flaw that can be exploited by a one-man starship?"). Perhaps most crucially, Shawcross points out that "The Administration does not support blowing up planets." "If you do pursue a career in a science, technology, engineering or math-related field," Shawcross writes, "the Force will be with us! Remember, the Death Star's power to destroy a planet, or even a whole star system, is insignificant next to the power of the Force."